Map of Antarctica. Claimed a territory of the United States in 1929 and 1935 by Antarctic explorers, Admiral Richard Evelyn Byrd and Lincoln Ellsworth, the Trust Territory of Marie Byrd Land and Ellsworth Land was organized in 2008 and 2009. 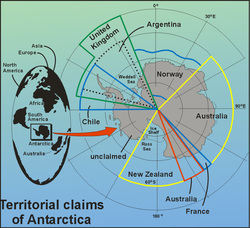 It comprises the land area in Western Antarctica that extends between 90 degrees West and 150 degrees West on the Antarctic continent, incorporating the Territory State of Marie Byrd Land and the Territory State of Ellsworth Land Antarctica in perpetual union. The area is governed by The Articles of the United States Trust Territory of Marie Byrd Land and Ellsworth Land accepted on January 22, 2008 and ratified on March 20, 2009 and protected United States property under: the Guano Islands Act (48 U.S.C. ch.8 §§ 1411-1419) federal legislation passed by the U.S. Congress, on August 18, 1856. The Act enables citizens of the U.S. to take possession of islands containing guano deposits such as Marie Byrd Land and Ellsworth Land. Under the Act the territory can be located anywhere, so long as they are not occupied and not within the jurisdiction of other governments. It also empowers the President of the United States to use the military to protect such interests, and establishes the criminal jurisdiction of the United States. // History Admiral Richard Evelyn Byrd in 1929 claimed Marie Byrd Land for the United States On December 21, 1929 a claim, in the name of Commander Richard Evelyn Byrd, was made that of all the land east of 150°W as part of Marie Byrd Land and territory of the United States. The Territory State of Marie Byrd Land Antarctica extends between 150°W to 103°24'W on the Antarctic continent and encompasses that portion of Antarctica lying east of the Ross Ice Shelf and the Ross Sea and south of the Pacific Ocean, extending eastward approximately to a line between the head of the Ross Ice Shelf and Eights Coast. It stretches between 150°W and 103°24'W. The inclusion of the area between the Rockefeller Plateau and Eights Coast is based upon the leading role of Rear Admiral Richard Evelyn Byrd in the exploration of this area. The name was originally applied by Admiral Byrd in 1929, in honor of his wife, to the northwestern part of the area, the part that was explored in that year. Lincoln Ellsworth in 1935 claimed Ellsworth Land for the United States On November 20, 1935 Lincoln Ellsworth discovered and claimed the area of Ellsworth Land between 80° W and 120° W for the United States and named the area, in honor of his father. Today, the Territory State of Ellsworth Land Antarctica extends between 103°24'W to 90°W on the Antarctic continent and encompasses that portion of the Antarctic continent bounded on the west by Marie Byrd Land, on the north by the Bellingshausen Sea, on the east by the Ellsworth Mountains. It is largely a high ice plateau, and has a number of scattered mountain groups including the Hudson Mountains, Jones Mountains and Walker Mountains. Ellsworth Land lies near the center of the area traversed by American explorer Lincoln Ellsworth on an airplane flight during November–December 1935. It was named for him by US-ACAN (1962) to commemorate that historic transcontinental flight from Dundee Island to the Ross Ice Shelf. Thiel Mountains between the Horlick Mountains and Pensacola Mountains part of the Transantarctic Mountains in Ellsworth Land Geology of Marie Byrd Land and Ellsworth Land Subglacial topography and bathymetry of bedrock underlying Antarctica ice sheet. The geology Marie Byrd Land and Ellsworth Land, West Antarctica closely resembles the Andes mountain range of South America. The most common rocks in West Antarctica are andesite and rhyolite volcanic rocks. There is also evidence of volcanic activity, even after the ice sheet had formed, in Marie Byrd Land. The most valuable resources near Marie Byrd Land lie offshore, namely the oil and natural gas fields found just outside the territory in the Ross Sea in 1973. Exploitation of all mineral resources is banned to member nations until the year 2048 by the Protocol on Environmental Protection to the Antarctic Treaty. A sub glacial lake, Lake Ellsworth is located in Ellsworth Land, West Antarctica under approximately 3.4 km of ice. Lake Ellsworth is approximately 10 km long and is estimated to be tens of meters in depth. List of volcanoes in Marie Byrd Land and Ellsworth Land Mount Frakesand Mount Steere Mount Sidley in the Executive Committee Range Marie Byrd Land contains the largest volcanic region in Antarctica, covering a length of almost 600 miles (960 km) along the Pacific coast. The volcanism is the result of rifting along the vast West Antarctic Rift, which extends from the base of the Antarctic Peninsula to the surrounding area of Ross Island, and the volcanoes are found along the northern edge of the rift. Protruding up through the ice are a large number of major shield volcanoes, including Mount Sidley, which is the highest volcano in Antarctica. Although a number of the volcanoes are relatively young and are potentially active including, Mount Berlin, Mount Takahe, Mount Waesche, and Mount Siple, others such as Mount Andrus and Mount Hampton are over 10 million years old, yet maintain uneroded constructional forms. Marie Byrd Land and Ellsworth Land contain a number of potentially active and inactive volcanoes and they include : Mount Andrus , Mount Berlin , Mount Frakes , Mount Hampton , Hudson Mountains , Mount Moulton , Mount Murphy , Mount Sidley , Mount Siple , Mount Steere , Mount Takahe , Toney Mountain and Mount Waesche. Clark Mountains , Crary Mountains , Executive Committee Range , Ford Ranges , Fosdick Mountains , Haines Mountains , Horlick Mountains , Hudson Mountains , Ickes Mountains , Jones Mountains , Kohler Range , Mackay Mountains , Ohio Range , Tapley Mountains , Thiel Mountains , Usas Escarpment , Walker Mountains , Whitmore Mountains , Wisconsin Range. Arctic and Antarctic History - Antarctic Explorers section, Richard E. Byrd, Byrd Antarctic Expedition I, (1928–1930) and Lincoln Ellsworth , Polar Exploration - Third Attempt (1935–1936).